With the support from Japan Neuroscience Society, I have attended the CAJAL advanced neuroscience training. This training is focused on ion channel in health and disease. This program includes lecture, hands on experiment techniques training, poster and social event. In total, 14 students from around the world attended this training. I will report this training from lecture, hands on training, poster and social event perspectives. There are two kinds of lecture. The first kind of lecture is given by the instructor of the experiment project. The other one is given by invited speaker who is leading in their special fields. In this part, I not only accessed the up to date knowledge and techniques in ion channel field, but also broadened my knowledge and built many connections and find cooperators. To my surprise, I have got connection with Professor Thomas Jentsch before attending the class by email. He is a leading scientist in transport proteins in Leibniz institute. In the beginning of this year, when I tried to find the KCNE3 plasmid from others, he kindly agreed to give me the plasmid. After the lecture, I caught a chance to talk with him privately and discussed my current research. In this part, there are two blocks. In the first block, I choose single channel recording. This is a classical experimental technique, so I do not report it in detail. In the second block, I practiced how to record intracellular ion channel in endolysosome. This is very new, so I will report it in detail. In this block, I chose single channel recording. When I came there, I learnt how to reconstruct ion channel into lipid bilayers and then do single channel recording. In this section, the main experiment skills I got were how to analyze single channel data, how to identify the recorded trace is good or not and how to make sure the trace is a single channel. It is very difficult to make sure the current is just from one single ion channel in experiment context, and the only way to decrease the error is record more trace and then use statistical methods to increase the power of the single channel component. In the second block of the experiment techniques training, I choose how to record intracellular ion channel in endolysosome. Endolysosomal channels are implicated in human disease such as lysosomal storage disorders leading to mental retardation, metabolic pathologies, cancers, Alzheimer disease, Parkinson disease and infectious disease such as Ebola virus infection. These intracellular organelle channels have a great potential as future drug targets. However, the detailed characterization of organelle ion channels is largely unknown because the limitations of the conventional patch-clamp technology. First, it is challenging to isolate intact organelles from a cell. Second, because of the extreme small size of the vacuoles (100 – 1000 nm), it is not readily applicable to patch-clamp with regular micropipettes. Moreover, whole-organelle configuration was unstable because isolated vacuole is generally less supported by a cytoskeleton. Currently, only three groups around the world can record endolysosomal ion channel current in the environment which is closer to the physical condition of endolysosomal. In this section, we, at first, plated HEK293 cell lines. One day after plated the cells, transfected with TRPML1 plasmid. About 10 hours after transfection, use vacuolin-1 to enlarge the endolysosome. Before isolation and recording current from endolysosome TRPML1 current, it needs to prepare the pipettes. In this experiment, the most important parts are preparation of recording glass pipettes, isolation of endolysosome and formation of whole-endolysosomal recording configuration. The glass of pipettes for endolysosomal recording is different from conventional whole-cell recording. The wall of the glass pipette should be thicker. Because the endolysosomal wall is not as stable as cell plasma membrane. If it still use convenetional glass pipette, it is easy to let the endolysosomal broke. The glass pipette’s out diameter is 1.5mm, and the inside diameter is 0.7mm. But it is not strict for isolation pipette. So any glass pipett is OK for endolysosomal isolation. When pull the recording pipette, it has strict requirement for the puller and glass pipette. The greatest challenge with endolysosomal patch-clamp is the production of suitable electrodes.In fact, in my traiing, I have tried 200 glass pipettes and only produced 4 pipettes which is suitable for recording. In this training, we use P-1000 puller. To the instructor’s experience, this puller is not stable as the one he used in his lab, P-97. But even if they use more stable puller, in his experience, 65% of the time required for endolysosomal patch-clamp is spent on the production of these electrodes. He also told me that he has tried many puller systems and only found P-97 is better. For endolysosome isolation, the next important stage is the dissection and release of enlarged endolysosomes using glass electrodes and patch-clamp micromanipulators. In this step, one of the most important things is the microscope. Because it need to see whether the isolation pipette is successfully broken the plasma membrane and see clearly whether the vesicle is endolysosome. The second important point is the angle of the isolation pipette. In previous studies, all the investigators used 300 degree, but the set up in the training lab can’t adjust the angle to 300 degree. So in this training, I used 450 degree. Luckily, I isolated endolysosome. In order to avoid confound factor in the recorded current, it need to fully isolate the endolysosome. But when let it too far away from the cell, it difficult to find it when change to recording pipette. The ideal distance is 2~3mm away from the cell plasma membrane. After dissection of lysosomes, the dissection electrode is exchanged for a recording electrode. As in whole-cell patch-clamp, the pipette is attached to the endolysosomal membrane using micromanipulators. I used a water objective with 40× magnification to visualize endolysosomes. After the recording pipette attached the endolysosome, slightly elevate the electrode to let the endolysosome detached from the plasma membrane. This will avoid the plasma membrane’s effect and delete confounding factor. Seal formation is monitored in a manner which is similar to whole-cell patch-clamp by applying a voltage step pulse of 5 mV (pulse duration 5 ms) from a holding potential of 0 mV. During this step, slight suction (about 0.4ml) is applied via a plastic pipette pressure system connected to the pipette holder (the pipette pressure system includes plastic three-way blood transfusion taps and 1-ml syringes). Successful gigaseal formation is indicated by a decrease to <10 pA of the current amplitude evoked by the voltage pulse of 5 mV. Endolysosome-attached configuration is established once a stable gigaseal has been reached. From this configuration, the whole-endolysosomal configuration can be established by rupturing the membrane by a ZAP pulse (fast voltage pulse—i.e., 0.1–50 ms with −200 to −1,000 mV). To the instructor’s experience, suction pulse applied via the mouthpiece, which is similar to that used in whole-cell patch-clamp, does not work. Although this technique is challenge, during this training, our group got two results: one from non-transfected cell (control) and one from transfected cell (the representative current trace is attached in the left). 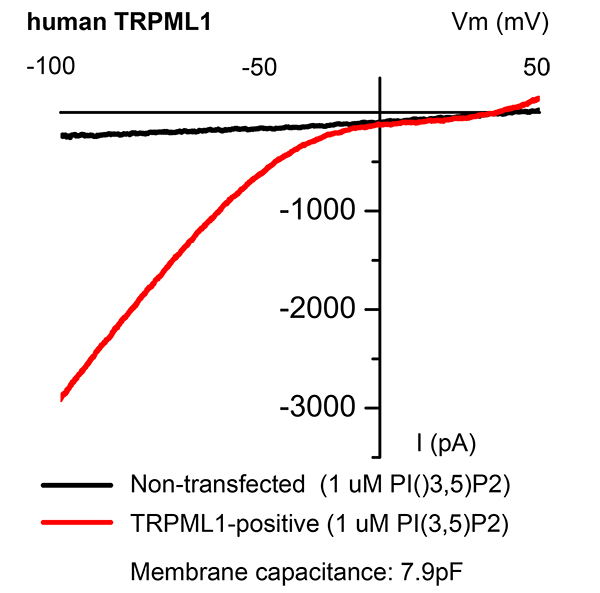 The transfected cell’s peak current density value is close to previously reported value. So the recording was successful. They have arranged poster presentation in two different phases, I only have the chance to attend the second part because of late visa issuance. The session has two merits. First, the presentation of my current project gave me an opportunity to discuss with leading scientists to make further development. For example, one professor asked the target of D609 to KCNQ1/KCNE1. Although my current results suggest it works on the pore of the channel, the evidence is not strong enough to prove it. It needs further study to prove it. They suggested to do single mutation. And some people also suggested adding the small compound specificity experiments on calcium channel. Second, observing other participants’ presentations and discussion with them help me broaden my horizon and enrich my own project. 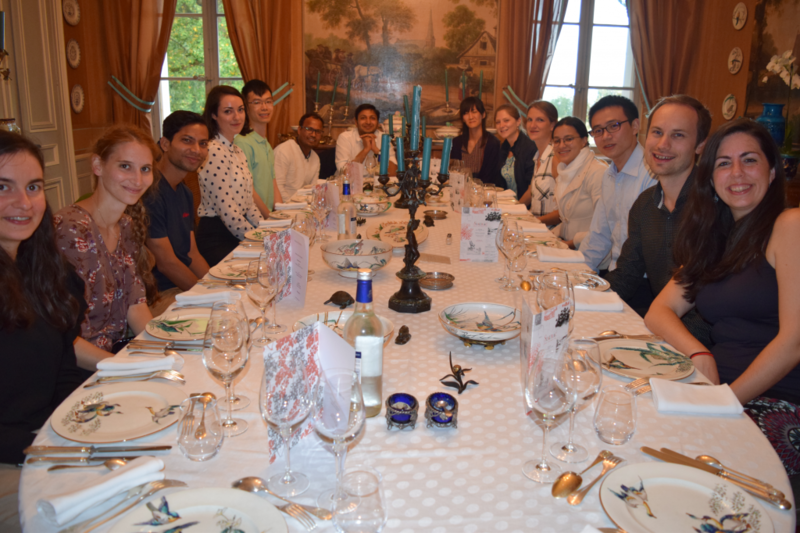 One afternoon, the hold institute organized a social event and we visited Saint-Émilion. During this visit, on the one side, we visited this historical place and saw how the famous wine was produced. This let us exposure to the culture of this place, especially the culture of wine. The guide also taught us how to distinguish different wine’s quality. And we also had our dinner in this famous place. On the other side, this is also a good opportunity for the exchange of all the things among the participants. Because in the lecture and experiment period, we have limited time to talk to each other. During this visit, we were talking freely among each other. One of the suppressing things was I met a participant’s supervisor in this year’s annual Japan Neuroscience Society. This workshop is well organized and interesting. It provided a good opportunity for me to have experiential learning of the state-of-the-art techniques in ion channel study under their leading scientist and technicians’ guidance. The practical “hands-on” introduction to advanced methods in ion channel extended my current research and it would be an important step forwards the mechanism of the small compound and the gating of the channel. It will also help me lay a solid foundation for my future research. By demystifying advanced technology, I think anything is possible and that techniques do not constrain my research. Therefore, I think I have benefit a lot from having this training programme. Besides, this course also helped me broaden my research perspective through the interaction with the lecturers and participators. At the same time, it was a good chance to make new connections and find future potential cooperators and exposure to France culture. This is also invaluable for my future career. I am very grateful for the opportunity and experience that the FENS-JNS Young Researchers Exchange Support Program (YREP) provided me with, and I would highly recommend others to apply for this travel award for next year’s CAJAL advanced neuroscience training.